Combine pineapple upside down cake and cheesecake for the ultimate dessert. 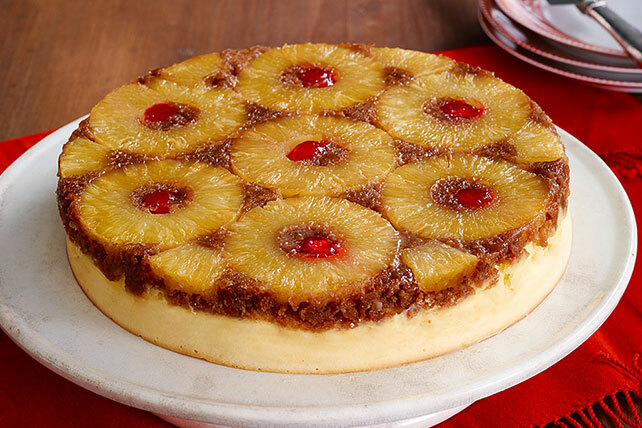 This Pineapple Upside-Down Cheesecake is the ultimate sweet treat. Mix brown sugar and 2 Tbsp. butter in 9-inch round pan until blended; spread to evenly cover bottom of pan. Top with pineapple slices, cutting if necessary to make even layer. Place cherries in centers of pineapple slices. Combine graham crumbs, 3 Tbsp. granulated sugar and remaining butter; press gently into tops of pineapple slices. Bake 55 min. to 1 hour or until center is almost set. Run knife around side of pan to loosen cake; cool completely. Invert cheesecake onto plate; carefully remove pan. Refrigerate cheesecake 3 hours. Savor a serving of this indulgent special-occasion dessert that is perfect for a party. One cakes makes enough or 16 servings.